The Hessian Nymph can be leaded, but fishes best mid-water and retrieved very slowly. Excellent alternative to Hare's Ear. Hook : Size 12 - 14. Tail : Pheasant tail fibres. Underbody : Lead wire (optional). Body : Hessian string dubbing (Type used by gardeners). Thorax : Hessian string dubbing. Rib : Fine copper wire. Wing Case : Pheasant tail fibres. Legs : Partridge breast feather fibres. Create the hessian string dubbing by brushing out with a wire brush. Although very coarse it spins very tight if used in a dubbing whirl. Varnish the wing case when the fly is complete. 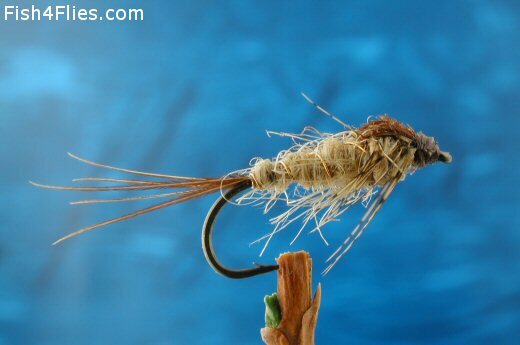 Currently there are no comments about the Hessian Nymph fly pattern from other fly fishermen yet.